if anybody is confused its me!! Lol! I'm not gonna worry about what it is except a really nice fish! I thought it was just a common. Scott Osmond saw it on FB and said it was a Ghostie..
Been fishing Almost every day for the last couple weeks. Each trip results in a fish or two. Heres today's capture. My PB Ghost Carpat 27-12. I've actually caught this fish 3 times. Twice last year and today.thought it was a common but was told it was a ghostie. My apologies for not showing . For the guy who misses nothing I've become the guy that doesn't show! !great job Rob !! 2015 Yankee Challenge - Register now! Ouch! The Boss said Sunday's are for Family not Fishing! Yes Dear! That's great!! Ne er a doubt!!lol! i with you on that. I do very little to mine. An end of the year leaning and oiling is it. I like buying new stuff anyway ! Went back for the fourth day in a row and was rewarded with 3 more fish for the 4 hours I fished. 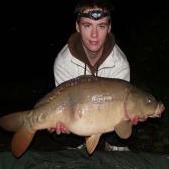 First a common of 23-11, a low double fully scaled Mirror and a 17-6 Scaley Mirror. All caught on 2 pieces of pop up plastic corn in a PVAbag of mixed particles .I also went back this morning for 5 in a row. Perfect conditions , light southerly wind, misty morning. I would have bet the ranch that I was going to catch. Good thing I don't gamble!! Lol! You gotta fish where the boats can't go! Lol! That's easier said than done on the weekends! Finally got off the river and hit my local (30 min) pond. Fishing short 4 or 5 hour sessions for 1 fish a trip. Fishing pop up corn with a pva bag of mix has been doing the business . Little fat Boy came in at 23+ and long lean fish at 24-6. Good to see you back Ray! I'm still on corn so I can't help here! Garcia, Rink, Pinner place 1-2-3, but Jerry Latka amazes us!